The basic attachments for a KitchenAid mixer are a whisk, a paddle and a dough hook, all of which get regular use from home bakers baking anything from cupcakes to baguettes. KitchenAid actually makes a wide variety of different attachments for their stand mixers, and not all of them are just for baking. 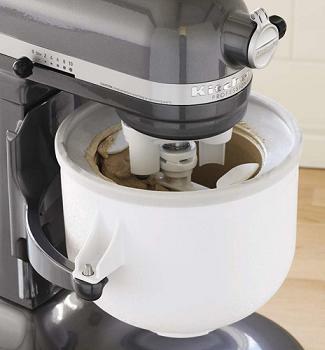 The KitchenAid Ice Cream Maker Attachment is one that turns your KitchenAid into an ice cream maker. The attachment is a freezer bowl that snaps into place instead of the regular mixer bowl. It needs to be frozen for at least 12 (preferably 24) hours before using it, but when the bowl is ready you can pour your ice cream base into it and churn your ice cream using an included dasher (ice cream churning paddle) attachment. This type of freezer bowl typically takes 20-30 minutes to churn a soft ice cream, then the ice cream can be transferred to a freezer-safe container for longer storage. This attachment is perfect if you already have a stand mixer and want to start making your own ice cream at home. With it, you don’t need to buy (or make room to store) a separate ice cream maker, and you can add one more thing to the list of great things you can do with your stand mixer. 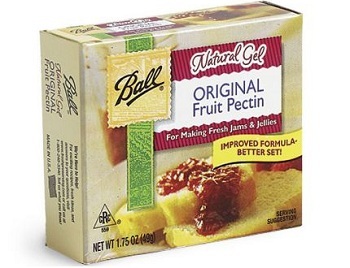 Next PostNext What is pectin? I enjoy using my Kitchen Aid for baking. I found it was too noisy when using the ice cream bowl for the time it needed to freeze the product. I loooove mine. This reminds me that I need to use it more often!! Words can not describe the love I have for my ice cream maker attachment. I store the bowl in the freezer so it’s always ready to go. 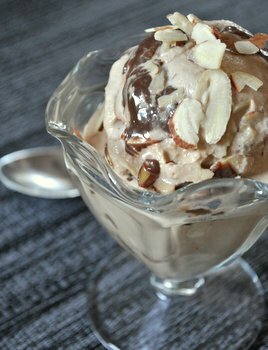 I have made so many different kinds of homemade ice cream with it. I also have a cover for my kitchenaide and a tip someone gave me was to place it over your stand mixer while it’s churning the icecream in the bowl so that it makes the air colder around the bowl, thus making the whole process a bit quicker. I really want a stand mixer and this has just given me another reason why! This is on my list of baking toys I really want to have. I feel like I would get a fair amount of use out of it if I bought one. It cant be a coincidence that this attachment has made two appearances on blogs I follow! There is ice cream in my future Thanks for posting! My wife doesn’t know it yet but she’s got an ice cream maker attachment coming in her future! Thanks Nicole for getting the word out. I use my KA stand mixer all the time. Hard to believe I’ve had it for over 15 years and it’s still going strong. I have all the other attachments and plan to buy this one soon. Ice cream is my favorite food and just another reason to keep that mixer going!! Just curious for those that have made batches of ice cream with this attachment — have you made two batches in a row? I’ve made one batch, transferred to a container and put in the freezer, cleaned out the ice cream attachment and started the second batch but it doesn’t freeze/harder like the first batch. Is this common? Is the freezer bowl not cold enough to handle two batches even if it’s been in the freezer for 24 hours? Any help/tips you could offer would be terrific. Thanks! My older sister just moved into an assisted living home and gave me her KitchenAid. I’ve never had one and didn’t know there was such a thing as an ice cream maker attachment. I’ve been wanting an cream maker but the attachment interests me more. I LOVE mine! The only downside is that it takes another 12 hours before you can make a second batch. I’m going to test out the cover tip from Jessica, but wanted to add my own. Make sure you wrap the ice cream maker in a plastic bag before putting it in the freezer; it stops unwanted ice and flavours getting in to your mix. Anita – You will only be able to make one batch at a time with this attachment. It simply defrosts too fast to do multiple batches, so you’ll have to refreeze it before doing a second. The only ice cream makers that really allow you to do multiple batches have internal compressors that create their own “cold” to do batch after batch.